You can import data from several different relational database management systems (RDBMS). In the Data source Builder, the yellow icons represent the available RDBMS data sources. Select one of the RDBMS icons shown above. Enter the host, port, user name, and password. After you authenticate your credentials, you can retrieve your data. You can select a single table from the Single Table tab. Note: If you would like to select multiple tables, you must use the Custom SQL or SQL Designer options (see Selecting multiple tables from a database connection) . Your data will automatically be assigned as either a metric or attribute. You can use the left and right arrows to edit the placements. Click Next to select a storage option. 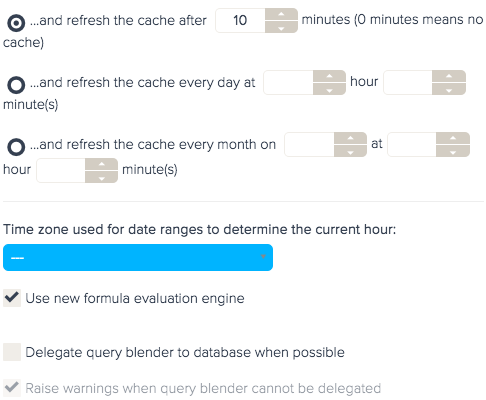 Select the Advanced tab to edit cacheing, time zone, and Query Blender settings. Click Save to finish adding your connection. If your database is on-site, you can connect to it locally and support a simple dashboard by storing query results in the cache. If you want to publish interactive dashboards on a delegated connection, the database needs to be open to the Web. The database must be accessible from the Internet. This means, a potential corporate firewall has to accept the call, route the request to the server, and be accepted by the server. To make this possible, your database needs to have a public IP address or needs to be NATed. White-list the IP address, 107.23.115.201. We will only connect from this address. You can check the SSH Tunnel option when connecting. TCP/IP connection is enabled in the surface area manager of the SQL server. Sign in with SQL server authentication logins and not Windows authentication. If you have a named instance, first try to not define the named instance in the connection. If possible, an instance should point to the default port. Database location: If your database is a local, you can connect using BIME Desktop. If you are using the web interface, you will need to whitelist all of domains with *.bime.io. IP addresses: If you are using the web interface, you might encounter issues with firewall settings. Please check that you have set the required security settings (see Security settings). Data limits: Some data sources, such as BigQuery and ElasticSearch, limit the number of rows you can import. If your data exceeds the set number of rows, you could experience a timeout error. To solve this, you can create a view in the Custom SQL option using the GROUP BY clause. Incorrect information: If you are still having trouble connecting, you might have entered incorrect information in the Info step of the Data source Builder.